Blue / Green Color - Ulano QX-1 Emulsion is an SBQ sensitized, hybrid dual-cure emulsion that combines the convenience and shelf life of SBQ with the durability, versatility, and imaging properties of dual-cure emulsion. 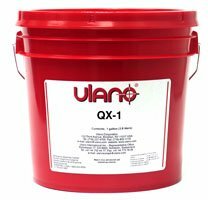 Ulano QX-1 Emulsion is compatible with all plastisol, UV, and solvent-based ink systems. Its matte finish virtually eliminates printing problems associated with high and low humidity conditions. QX-1 is formulated to provide wide exposure latitude and is easily reclaimed even if underexposed and used with aggressive inks and washup solvents. Ulano QX-1 Emulsion is durable and has excellent resolution, good definition, and very good wet strength. 37% solids content provides good stencil build per coat, excellent bridging of coarse mesh, and fast-drying capabilities. Ulano QX-1 Emulsion is presensitized and must be handled in yellow safe light conditions before exposure. Reduced hydrostatic attraction in low humidity; no ink "feathering"
If you have any questions about this product by Ulano, contact us by completing and submitting the form below. If you are looking for a specif part number, please include it with your message.